Your manuscript is ready for its final polishing, and now you need editing help. No problem – we offer a professional book editing service second to none. Our best editors do much more than proofreading; they make your sentences flow well, so that readers remain engaged in your book, blog, article or other text. Our professional editors take your words and make them shine. Now you are ready to publish. What we do is make you look great! If you are looking for the best editing services available, just fill in the form on this page and let us know how we can help you right now. Sometimes add vigor to the text. In many cases, a simple copy edit will do. But if your book needs a lot more work than this, you might not be looking for an editor; you might be looking for a book writer. You can find one here. I can’t thank you enough for the excellent job you did. The article flows like a symphony… Of all the editors that did help me out – in my other publications – you are the best. I am very happy that I found you. and grateful for David that he recommended you. I will now submit the article for publication and if accepted I will hand you the book for your editing. People hire a manuscript editor for their book for several good reasons. Here are some of the reasons our clients have mentioned over the years. Tap or click to read more reasons to hire a professional business writer. You know your writing isn’t quite up to publishing standards. You might have an amazing story to tell, whether fiction or non-fiction. But that does not make you an expert writer. What if your writing is mediocre? 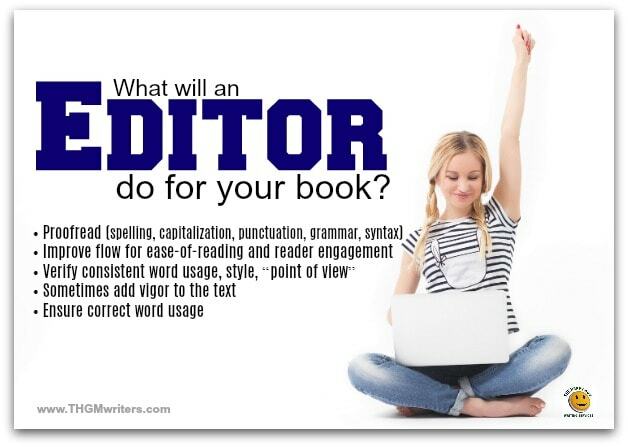 Hire a professional editor to help you perfect your manuscript. The editor will help you improve the text and bring it up to publishing standards. If English isn’t your first language, if you never went far in education or if you are simply more inclined toward math or science or baking, you can still be an author. Finding a book editor you can work with is the next step..
A publisher tells you to hire a manuscript editor. I wrote this book and I have a publisher. But he says it needs work, and I should hire a professional book editor. I need help. That’s a great reason to hire a book editing service like ours. First, you know your idea is strong, because a publisher is interested. Second, you know your approach is strong, because a publisher sent you to find a book editor rather than to rewrite from scratch. Third, you are so close to becoming an author; all your manuscript needs is a good edit. You hire a book editor to save money. Sometimes this works. Sometimes it doesn’t. Your writing is reasonably good. The structure of your manuscript is solid. Unfortunately, half the people who seek our editing services have fairly poor writing or a story that needs complete restructuring. Sometimes, a manuscript has both issues. In either of those circumstances, it would be less work to rewrite the book from scratch. You will probably still save some money, perhaps $1,000. Because your information is well organized, the writer will save some time, even rewriting if from scratch. You will be bound to get the story you want, because the details and the approach will be very clear to the writer. Every now and then, somebody comes to us with a really good manuscript. Sometimes it looks more like the “after” picture, as if it had already been edited. In fact, sometimes we are not the first editing agency to work on the manuscript. That’s called perfectionism, and it often helps a manuscript read better. With multiple edits, it is more likely to get accepted by a publisher and hailed by book reviewers. Looking for professional editors and ghostwriters who can improve your manuscript? We have them! For a free quote on editing your book, tap or click the red button to the right. It’s not that hard to work with a book editor. You’ve already done most of the work just writing the manuscript. Now it’s up to the editor. Explain your goals to the book editor. You might not have any specific goals, and that is fine. But if you are looking for a manuscript editor, chances are you have some idea what needs fixing. You might know that the dialogue is a bit dry. You might know that you have been verbose. You might know that your grammar is weak. Then give your book editor very precise instructions. But also let your editor improve anything else she sees. Tell your editor about special exceptions. You might have a very conventional manuscript. Or their might be some eccentricities. For instance, you might break the rules in dialogue, based on how a character speaks. Tell your manuscript editor about all the exceptions to the rule. You don’t want her to “correct” these purposeful anomalies. Book editing in “Track Changes”. What if your manuscript editor does “correct” errors that you had included on purpose for whatever reason? What if you simply don’t like a particular edit, preferring your original wording? Track Changes to the rescue! Track changes give the editor free reign to make whatever changes she feels will improve the manuscript. And it gives you full control over what changes end up in the published book. If you are looking for a professional manuscript editor, let us help. For a free quote on editing your book, tap or click the red button to the right. “Help! I need a book editor!” Finding a book editor for hire is simple; you have already done it. Hiring a book editor is even simpler. Just fill in the form on this page, and let us know what type of editing services you need.